For product development teams, the notifications and other emails their apps send are indispensable tools for driving user activity, building trust, and nurturing long-term engagement. Product emails have an outsized impact on key outcomes like conversion and retention. But it’s sometimes hard to know where to begin. 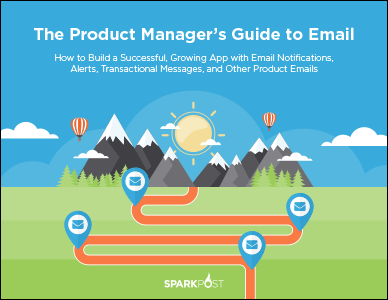 That’s why the email experts at SparkPost created this guide to email notifications and other app-generated email messages. It provides the foundation teams building fast-growing services need to make the most of email in their products. Key use cases for the emails users want to receive—and how they can be used to increase conversions, generate engagement and reinforce trust and confidence in your app. How product teams can measure email performance and impact. The right way to implement emails for your app, as well as the technical challenges and risks you’ll want to avoid. This resource for product managers and development teams is vital reading. Download “The Product Manager’s Guide to Email” today!